Curtain cleaning can be quite a daunting task, especially since curtains, like carpets, act as filters and are prone to catch and hold odors and airborne dust. You can easily test this fact with a basic sniff test. Smell the fabric of the curtain by placing it close to your nose. You will soon know if they are fresh and clean, or stale and dirty. Top Cleaners offers premium cleaning services in London, with curtain cleaning being one of the many specialized services on offer that aims at a cleaner, safer, and a healthier inner environment. Providing professional and reliable cleaning services since 2001, Top Cleaners can make your curtain cleaning woes come to an end. Professional curtain cleaning services can be immensely helpful to you because your curtains can be cleaned completely to become spotless, a task that is quite difficult to achieve at home with limited equipment. In this regard, it is better to use the services of a professional cleaner who can clean your curtains as they are—you don’t even need to take them down. Since most professionals use the best modern day techniques along with carefully trained staff in every aspect of their work, curtain cleaning should no longer be something to be stressed about. 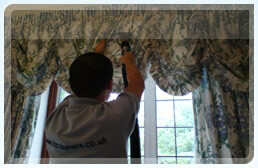 Professional cleaners clean thoroughly all around the fabric so that your curtains will smell, look, and feel great. This is generally done using equipment and products that are 100% safe to be used in any home. The process of curtain cleaning begins with a pre-testing of your curtains to check if they are safe for cleaning, followed by vacuum cleaning them with specialized curtain cleaning tools. Then comes a more comprehensive cleaning to remove any embedded dust or stains and odors. The benefits of such professional cleaning are many; your curtains receive the kind of immaculate cleaning that is often not possible at home. The products and equipment used also eliminate the risk of color change or any damage to the fabric as most professional cleaners take special care in ensuring the gentle handling of your curtains. Top Cleaners are among the best professional cleaners that provide services in and around the London area and are available at a short notice. There is a provision for a variety of payment methods so, that you can choose that which is most convenient. A thorough curtain cleaning service leads to a healthier and safer indoor environment, so do not postpone your curtain cleaning any longer.